Styles change and attitudes evolve, but the core of the debate on climbing styles is about how to maintain the challenge of climber against rock and how to play the game in a way that fairly tests the climber. Climbers adhering to traditional style prefer to climb each route strictly from the ground up, with no help from such aids as top ropes or preplaced protection. New routes are explored and protected only on the lead. After a fall, the climber returns to the start of the climb or at least to a no-hands resting place. Climbers following the European-influenced sport-climbing style are more likely to find other techniques acceptable as well. This can include inspecting the route on rappcl before trying to lead it from below. It can also mean cleaning the route and perhaps placing protection on rappel. Routes may be climbed with multiple falls, by resting on the rope while checking out the next move ("hang-dogging"), or by rehearsing moves with the help of a top rope. These sport-climbing techniques have made it possible to climb harder and harder routes. A par ticular climbing area may lend itself more to one style than another because of the type of rock, the difficulty of the routes, or the conventional style of the local climbers. In the world of climbing, there's room for a diversity of styles, and most climbers will experience a variety of them. No matter what the style, a climber will work to eventually climb the route by putting no weight on the rope or on any piece of protection. The goal is to "redpoint" the route; that is, to eventually lead a complete no-falls ascent. Better yet is to "flash" the route, leading it all the way with no falls on the very first try. Best of all is to flash it "on sight"; that is, without prior inspection or knowledge. The subject of ethics has to do with respecting the rock and every person's chance to use it. Unlike climbing style, ethics involves personal decisions that do affect the experience and the enjoyment of others. This includes the sticky question of the manner in which bolts are placed on a route. Are bolts placed on rappel different—less "ethical"—than bolts placed on the lead? Traditional climbers may argue that bolts placed while on rappel rob others of the chance to try the route from the ground up. But other climbers may say that placing the bolts gives a chance at a route that otherwise would be unclimbable. Each area has its own tradition of what styles and ethics are acceptable, and visiting climbers should observe the local standards. It's not hard to find out what they are. The guidebook will say, the locals can tell you, and you can always just look around at what the other climbers are doing. This book won't try to resolve issues of style and ethics. But there is general agreement on a couple of principles. First of all, preservation of the rock is paramount. Chipping the rock to create new holds is almost universally condemned. And while bolt-protected routes are common in many areas, bolting should not be indiscriminate. In the mountains or other wilderness areas, away from concentrated centers of rock climbing, it's particularly important to preserve the environment for those who follow. If possible, stick to clean climbing, using only removable chocks for protection. Secondly, it's almost never justified to add a bolt to an existing route. If you feel you can't safely climb the route as it is, don't try it. 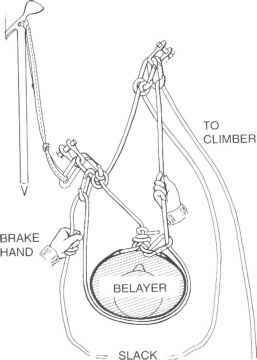 Exceptions may occur when a consensus of local climbers, usually including the person who first climbed the route, agree that another bolt should be placed to promote safety and enjoyment. There's rarely any objection if you replace an old bolt with a newer, stronger one or add a bolt at an established belay or rappel point. Keep other climbers in mind when you're out climbing. If your party is moving up a multipitch route much slower than the people behind you, let them pass at a safe spot, such as a belay ledge. Beware of tackling climbs that are beyond your abilities. You may prevent more capable climbers from enjoying the route. And if your inexperience gets you in trouble, you may end up dragging the other climbers into your rescue. Access to many climbing areas is threatened and two issues are usually at stake. The people who own or manage the land arc worried about liability for accidents and are concerned that climbers are defiling the environment. As climbers, we can help by taking responsibility for our own actions. It's up to us to put in dependable anchors and otherwise promote safety—and to provide rescue services when they're needed, rather than expecting others to do it for us. It's also up to us to leave areas in as natural a state as possible. Chalk, rappel runners, fixed protection, and litter can be eyesores. We can help by establishing rappel anchors that don't require leaving slings, using colored chalk that blends in with the rock, keeping bolt placements to a minimum, and removing all litter. These efforts can promote public acceptance of the sport and help maintain access to climbing areas.